Energy has been an inevitable component of human lives for decades. Recent rapid developments in the area require analyzing energy systems not as independent components but rather as connected interdependent networks. The Handbook of Networks in Power Systems includes the state-of-the-art developments that occurred in the power systems networks, in particular gas, electricity, liquid fuels, freight networks, as well as their interactions. 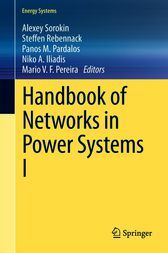 The book is separated into two volumes with three sections, where one scientific paper or more are included to cover most important areas of networks in power systems. The first volume covers topics arising in electricity network, in particular electricity markets, smart grid, network expansion, as well as risk management. The second volume presents problems arising in gas networks; such as scheduling and planning of natural gas systems, pricing, as well as optimal location of gas supply units. In addition, the second volume covers the topics of interactions between energy networks. Each subject is identified following the activity on the domain and the recognition of each subject as an area of research. The scientific papers are authored by world specialists on the domain and present either state-of-the-arts reviews or scientific developments. Panos Pardalos is Distinguished Professor of Industrial and Systems Engineering at the University of Florida. He is also affiliated faculty member of the Computer Science Department, the Hellenic Studies Center, and the Biomedical Engineering Program. He is also the director of the Center for Applied Optimization.Dr. Pardalos obtained a PhD degree from the University of Minnesota in Computer and Information Sciences. Dr. Pardalos is a world leading expert in global and combinatorial optimization. He is the editor-in-chief of the Journal of Global Optimization, Journal of Optimization Letters, and Computational Management Science. In addition, he is the managing editor of several book series, and a member of the editorial board of several international journals. He is the author of 8 books and the editor of several books. He has written numerous articles and developed several well known software packages. His research is supported by National Science Foundation and other government organizations. His recent research interests include network design problems, optimization in telecommunications, e-commerce, data mining, biomedical applications, and massive computing.